Build with Grandpa is a children’s iPad app. I have previously reviewed At the Zoo with Grandma and Grandpa, and Grandpa’s Workshop by the same developers, Fairlady Media. Demolish an old building with a wrecking ball, clear the lot with a bulldozer - then design, build, paint, decorate, and landscape a brand new house! 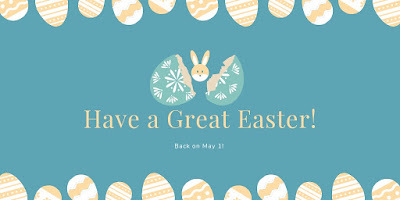 Along the way you'll learn about safety equipment and power tools, empty your dump truck, dig and pour a foundation, mix cement, drive construction equipment, enjoy lunch with Grandpa, and measure and build a wall with wood! Be creative as you design from blueprints, paint the house with rollers, and choose your own windows, doors, shutters, landscaping, and fun extras! Ages 5-9. I loved the way the developers have gone the extra mile and designed activities kids can do that mimic the actual building process. First up they swing the wrecking ball to smash down an old building. I took a screenshot which you can see in my main image. Who hasn’t wanted to operate a wrecking ball? Such fun! And kids can experiment by changing the arc of the ball swing and pulling back to apply more power. Then it’s time to clear the debris, and then up come some blueprints to match up and choose from. Lots of extra activities guide children through the process of building, and Grandpa’s kindly voice is always at hand with encouragement and explanation. I also liked that the developers included some short educational activities — maths and reading actually applied to practical situations are much more fun! Kids who love big machines will get such pleasure out of this one, as will children who like to learn about things that happen in real-life. 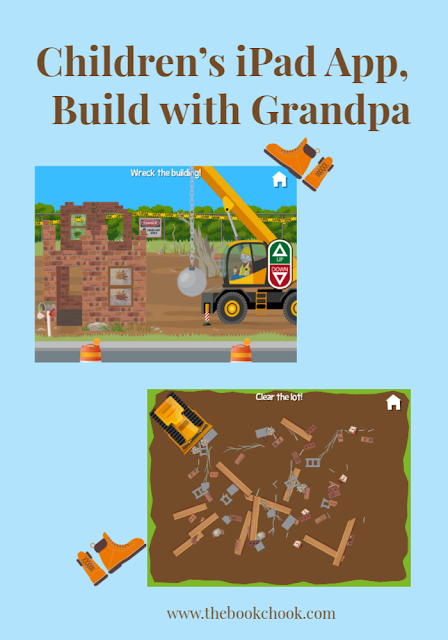 Because there are problems to solve and questions to answer in Build with Grandpa, I’ll be adding this app to my list of Intriguing Puzzle Apps for Kids. Check out the short trailer for Build with Grandpa, below. Find all of my iPad App Reviews on Pinterest, and find more apps and articles via my Listly page. The Book Chook is taking a break and will be back May 1, 2019. This is the first instalment of recently published books that I recommend for older readers in 2019. Check out the suggestions I made in 2018 here, here, and here. Hotel Flamingo is a junior novel by Alex Milway, published by Picadilly Books, an imprint of Bonnier (2019.) RRP: $Au 12.99 PB. Kids who have graduated to chapter books will grab Hotel Flamingo eagerly. The publisher suggests and age-range of 5 - 7, but I can certainly see slightly older children enjoying it. Especially those who like fiction stories with animal characters, problem solving and humour. There are 170+ pages, but the font is large, and there are many illustrations to break up the text, making it ideal also for young readers who need some support. Milway’s internal illustrations are delightful and striking - cartoon-style figures in a limited palette of bright pink, black, white and shades of grey. They certainly add humour as well as helping kids’ comprehension of the story. Apparently there are three more books in the series, too, something that will make series-lovers happy! Lenny’s Book of Everything is a children’s novel by Karen Foxlee, published by Allen and Unwin (2018.) RRP: $Au 19.99 PB. Lenny’s Book of Everything grabs your attention from the get-go. Lenny herself is a strong point-of-view character - we are immersed in her world, her life with Mum, brother Davey, friends CJ and Matthew Milford, neighbour Mrs Gaspar and others. Readers will certainly laugh with Lenny, and will also cry. Foxlee writes with great craft, always choosing the exact phrase, sentence or paragraph to bring Lenny’s story to life. I can certainly see why the publisher’s blur refers to this novel as being “classic”. It is one of those children’s books that can be read equally and enjoyed equally by adults, I believe. I would frankly recommend it to anyone who enjoys a well-written story, one full of heart, courage, and the joys and pains of being alive. It has already been chosen in the CBCA’s short list for Children’s Book Week 2019. I loved it, and predict more awards coming its way. The Dog Runner is a children’s novel by Bren MacDibble, published by Allen and Unwin (2019.) RRP: $Au 16.99 PB. Like How to Bee, which I reviewed here, The Dog Runner is also set in a dystopian future. There’s a grass fungus world-wide and for Ella in Australia that means not just dying grass, but many of the products she loves to use to make Anzac biscuits - flour, butter, sugar, golden syrup - are no longer available. Slowly we learn about Ella’s world through her perspective, and realise what a dangerous out-of-control place it has become. The children’s journey tightens the tension even more as Ella and Emery deal with crisis after crisis. Will their resilience and determination bring their family back together again? The publishers recommend this book to young people aged 10 - 14 and that feels right to me. I would recommend it to kids in senior primary or early high school who like fast-paced adventure, strong characters, tension and drama. Australian Birds is by Matt Chun, published by Little Hare Books, an imprint of Hardie Grant Egmont (2018.) RRP: $Au 29.99 HB. It took millions of years of isolation and a diverse range of habitats for Australian birds to evolve the way they did. The result is many of the world’s most striking and beautiful birds, including some that are stranger than fiction. In Australian Birds, acclaimed artist Matt Chun showcases 16 remarkable species that have captured the imagination of the world. 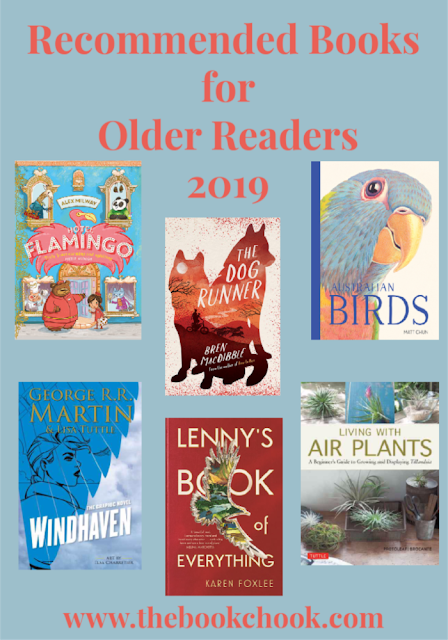 From the iconic cockatoo, to the endangered Cassowary, Australian Birds has been carefully curated to inform and entrance readers of all ages. I admit it freely - the art work in this book took my breath away. What an accomplished artist Chun is! The birds’ portraits are so realistic, not photographic, but incredibly detailed and accurate, and done I think with pencil and watercolour. Individual birds often seem to me to have a personality, and Chun has captured that too. Australian Birds has been short-listed by The CBCA for the new illustrator award. You can also take a look at some of the different work on his website. Schools though will not buy this book simply for its artwork. Even though I’ll bet that’s what children will pore over! It will also make a great resource for your Australian animal collection. Chun has written a description of each of the sixteen birds, and it includes facts about food, habitat, breeding, special characteristics etc. Reading age? Although the publisher classifies it as YA, I believe Australian Birds would probably suit senior primary onwards. Windhaven is a graphic novel written by George R.R Martin and Lisa Tuttle, illustrated by Elsa Charretier, published by Titan Publishing Group (2018.) RRP: Au 39.99 HB. I like the idea of a graphic novel version of the fantasy classic, Windhaven. Today’s generation of teen readers has the luxury of so many different formats as a way into reading! Some kids might never even think of reading a novel dense with text. Yet this version in full colour, with illustrations AND text in speech bubbles and captions may seem much more approachable. Maris is a strong female character, determined and brave. I think many young people will understand the theme of seeking and finding your own destiny and being true to your self. The flyers themselves are so joyous - both illustrations and text combine to pull readers in to share their joy in soaring and gliding on currents of air above the treacherous waters beneath. The art work is delicately coloured, detailed, atmospheric. I know teens who love comics will appreciate it. The world-building is excellent as you would expect from a writer of Martin’s calibre, and underpins the story. I would recommend Windhaven to libraries who cater to teens, not just because of all the above, but also because it is a sturdy hard-back book, very well bound. Living with Air Plants: A Beginner’s Guide to Growing and Displaying Tillandsia is a book for adults by Yoshiharu Kashima and Yukihiro Matsuda, published by Tuttle Publishing (2018.) RRP: $Au 29.99 HB. I have been growing bromeliads and tillandsia for a number of years now. Mostly at my place the air plants are outside, tied to trees and old tree ferns. And mostly I garden by instinct and Google, so I was pleased to discover this fascinating book. Would it teach me anything? Oh yes! While Australian readers should be aware that the book is written for the northern hemisphere, (mostly this just means you need to take care with information about the months and seasons) it is literally crammed with information. The photos work very well with the text, especially in the step-by-step instructions. I am now confident enough to try some of the delightful air plant display ideas for indoors, knowing that I understand how to properly look after the plants. I believe this book will appeal to different groups. On the one hand, there will be those such as me who like air plants and want to know more about them, or get ideas for displaying them. On the other hand, there may be those who have no idea about these versatile and unusual plants - but they want something quirky and easy to look after for their home. I found Living with Air Plants to be a very thorough guide, both practical and inspirational. It would make a great gift for a gardener, or a good choice for the public library! 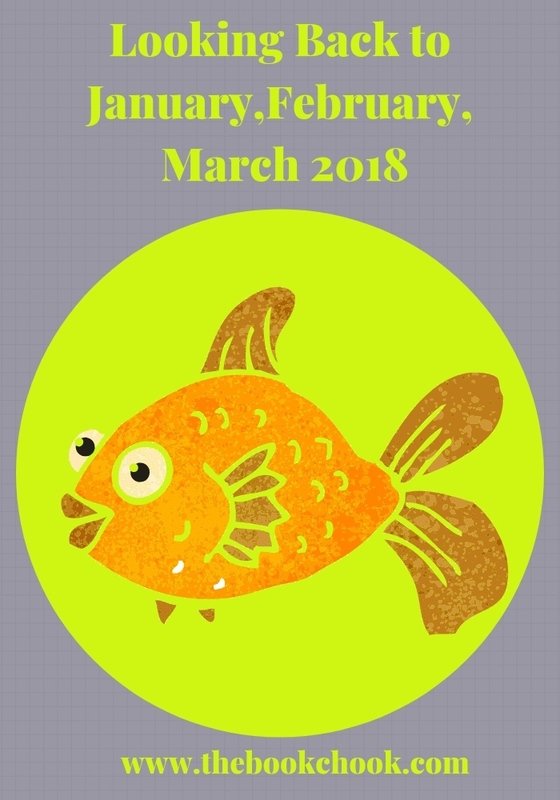 In 2018 I began a series of Writing Tips for Kids. This is the eighth in the series. Over coming weeks you’ll see more short articles, each of them addressing young writers, and dealing with a topic helpful to them. I’ve created a new List for these articles and will add to it over time. The List is embedded below. 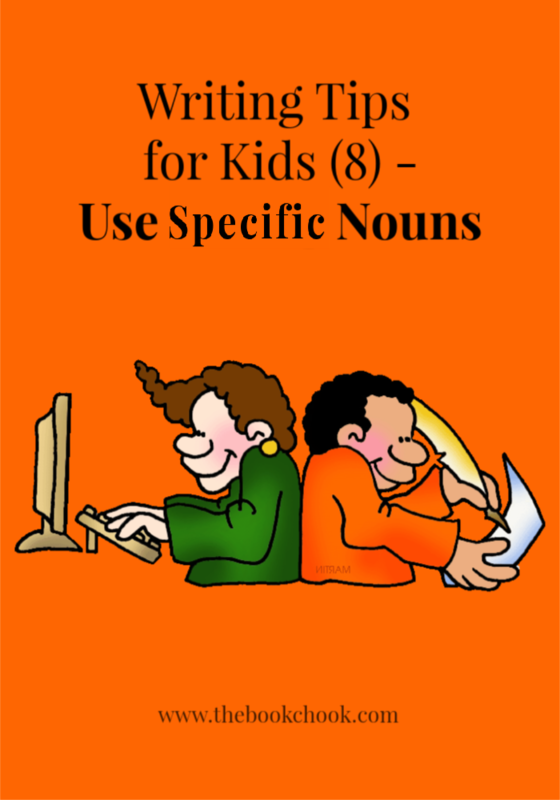 In Writing Tips for Kids 7, we discussed strong verbs and why we use them. We learned it’s about taking steps to make our writing more powerful. We choose the best words to to be really clear and descriptive. Just like with verbs, we want nouns that make a specific picture in a reader’s mind. It’s much better to use a specific noun like Tyrannosaurus rather than a general one like dinosaur. Tyrannosaurus instantly gives readers a word picture they can see in their imaginations. If they read dinosaur, readers don’t know what picture to have in their minds. Look at this sentence: “Marta jumped into the car.” We have no real idea about the car. It’s not an elephant, we know that, but Marta is jumping into some kind of thing made of metal with four tyres is all we know. But if we write: “Marta jumped into the shiny red Ferrari” the meaning is clearer. We added extra with a specific brand of car, “Ferrari” and "shiny red". Readers can instantly imagine the car. They know its colour and get an impression that it’s fast and probably was expensive. They might even start to build a mental picture of Marta. Let’s say your character, Vance, is climbing a tree. What kind of tree is it? If you tell us Vance climbed a tall gumtree, we can practically smell that eucalyptus smell of gum tree leaves, we might be able to imagine how the bark feels under Vance’s fingertips, and we get the idea that Vance is pretty brave to be climbing a tall gum. As a writer, you’ve chosen a specific noun - gumtree - that many Australian readers will be able to connect with via their senses. If we can pull a reader into our writing by appealing to their senses and emotions, it makes our writing doubly effective. Can you make these nouns into stronger, more specific ones? bike: …………; dog: …………..; sport…………; toy ……………. ; game: ……………. creature: ………………. Chloe and Xavier could hear the creatures' noises as they came towards them. When they saw the creatures, their fear made them feel bad. You could use your sentences as the start of your own story. Don’t forget, when you read through your first draft, look for verbs and nouns that will make your story clear and effective. You might also like to read Writing Tips for Kids - How to Start, Writing Tips for Kids 2 - Write What You Know, Writing Tips for Kids 3 - Developing Characters, Writing Tips for Kids 4 - Writing Funny Stories, Writing Tips for Kids 5 - Start with a Hook, Writing Tips for Kids 6 - Remove Repetitions, Writing Tips for Kids 7 - Use Strong Verbs. 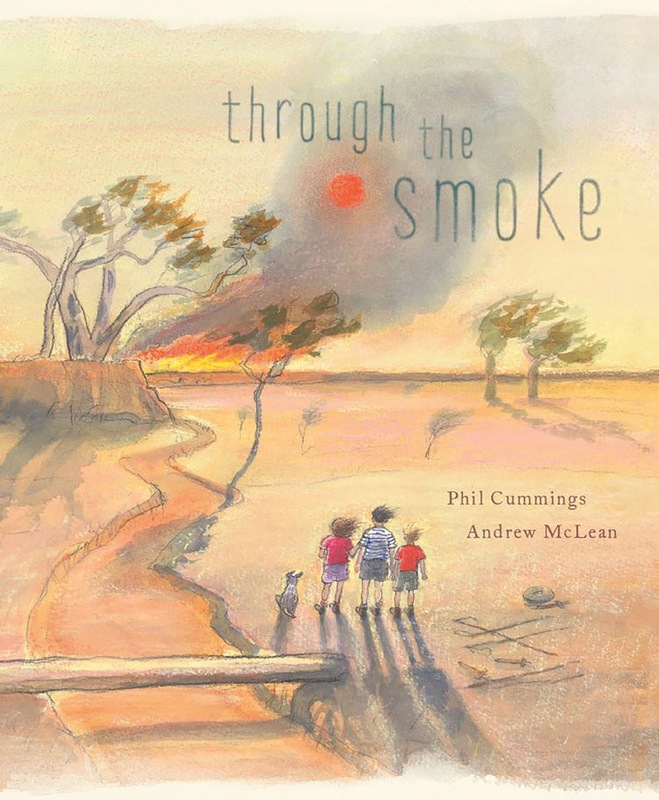 Through the Smoke is a children’s picture book written by Phil Cummings, illustrated by Andrew McLean and published by Scholastic Press (2019.) RRP: $Au 24.99 HB. I’ve read and reviewed many of Cummings’ books. The most recent was Feathers, which I loved. In Through the Smoke, Cummings shows us fire through the eyes of three Australian kids who are almost trapped by it. I loved the emphasis on the children’s imaginative play throughout the story, and the wonderful, poetic use of language. Sentences like “The wind was the breath of a sleeping dragon.” set the scene for young readers, and evoke a sense of menace before we even get to the fire. I always enjoy Maclean’s illustrations. Like Cummings, he just seems to be getting better and better. The children’s make believe play is spot-on, and MacLean’s art helps build tension and atmosphere as the fire/dragon gets closer. The actual fire scenes are scary but superb. Through the Smoke is an excellent suggestion for those librarians and teachers looking for picture books that children can relate to. I will be adding it to my list of Picture Books about the Environment. It makes a great read-aloud, is full of drama and action, and will be an excellent model for young writers.